Light screen portable is an easy and simple tool with which you can take pictures from any site and you can load it in your USB Flash, iPod or use it in any other computer later. The good thing about it is no personal information is left behind. A screen shot is also known as screen capture or screen dump. It is the image taken by the computer to visualize the items on the monitor. The image is digital and it is used to demonstrate a program of what is done in ones computer. The image format is bitmap such as BMP, PNG, or JEPG. Such screen shoot are used in video games. These screenshots have so many uses such as employee surveillance, to create fan art. Here are some of the great easy to use features. Make screen shots of the present desktop, optioning, custom path support (you will be able to save the screen shots anywhere you want on your portable device), screen shot delay, save your screen shots (in many different types of formats such as PNG, JPEG and many more) and many other features. Portable means it can be easily carried or moved. Any portable application is a computer program which can be easily carried around in the USB, iPod, or any other device and fixed in another computer and used. 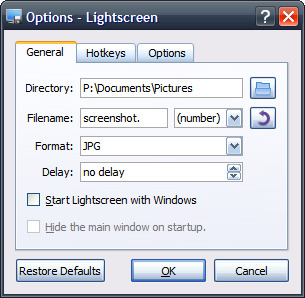 Lightscreen is one such portable application. It does not need any additional software. A nice app. This reduces the need to use the Print Screen option in the keyboard, pasting it into MS paint and then cropping editing.